Record crowds turned out for our 2010 Memorial Day weekend wine event. The weather over Quailhurst was beautiful and sunny, while just miles away it poured the entire weekend! Guests sampled 16 wines, including two barrel futures. For the very first time, we hosted our event in one of our stables while the horses spent the day grazing in the pastures. With barn aisles carpeted and windows draped in curtains, guests old and new enjoyed the large assortment of food and cheeses along with live music. Our equine ambassador Abercrombie (as named for our 2007 vintage) greeted guests from beginning to end, never tiring of his assignment for the day. 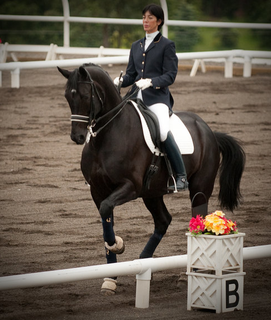 Deborah and Ferrogamo continued to delight the crowd with the dressage demonstration, performing the moments from the Grand Prix. Crowds flocked to get their first glimpses of the new foals Ferggie and Ferrona. Quietly clicking away were many photographers gathering and Facebook-posting their version of how they see Quailhurst and we have loved seeing all their images from the day. But we must send a very special shout out to photographer Loma Smith who chronicled a day in the life of a Quailhurst gathering in this beautiful slideshow and the photos in this post.